Dateline: Fall 1978 — Fall 1981. The infamous Marina Del Rey Skatepark was located near Santa Monica and Venice Beach. The world renowned “Dogtown” area was a Hotbed of Extreme Skateboarding Talent, Innovation and Style. Naturally, Santa Monica Bay area skaters needed a local place to get together, hang out. Marina Del Rey Skatepark was developed from concept by Dennis Ogden, an ambitious, 24 - 25 year old local surfer / skateboarder type building contractor with a recent degree in Construction and Architecture from SMCC. With the design expertise of the industry well – known, Ray “Woody” Allen the Park was up and running by November, 1978. The initial skating area consisted of, Three pools complete with tile, coping and a special plaster, A 10’ deep half pipe with a capsule end, Two intermediate “brown” bowls, a beginners bowl area, a 230 yard long slalom with smooth transitioned banks, and a large freestyle area with gentle sloping banks. All common areas and terraces between the runs were finished so you could literally skate all around from the upper levels to the entrance. The response was tremendous with the local skaters ripping, shredding and living up to their “hero” status along with visiting ambassadors of the sport, roller skaters and BMX’ers. We were getting geared up for our first big contest event. With ten thousand dollar prize money, the “Gyro Dogbowl Pro” had the biggest payout of any similar contest at that time. Every day skaters were stoked to be in the same arena, sessioning with the Legends and pros. (See photos and videos). This “DogBowl Pro” event consisted of Pool Skating, highest Arial and longest carve. There were divisions for men and women and also categories for Roller Skating pool riding, freestyle and long jump competitions. Most all of our major contests were documented by Rick Ogden and other well known Cinematographers and Photographers. The Ogden family pitched in to make it a “Uniquely personal atmosphere which should make your visit a pleasant one”. Craig Fineman…. We received a lot of publicity and photos from Skateboarder Magazines and other publications. Vogue Magazine published a travel article with our story and picture. The famous punk rock band “Devo” filmed their early “Freedom of Choice” music video there. Being close to “Hollywood” commercial film location requests was routine. TV pilots, commercials and movie segments were filmed, more contests were in the works and the place was jammed with stoked skaters. A custom sound mix was piped through our faux pool light speakers. Hal Jepson was working on the feature film “Skateboard Madness” and the magnificent Turning Point Ramp (full pipe) was trucked in, and set up for the anticipated movie release. (See photos). The release of “Skateboard Madness” would be put on administrative hold for some five years..
By this time about late 1980 Ray Allen had moved on to start a successful TV Production company and a weekly skate series called “The Ray Allen Show” . We were fortunate to have Christian’s Hosoi’s dad, Ivan Hosoi step up as manager and what a blessing that was. When Ivan had time, he would create posters and fliers for our skating events and our Monday Night Punk Rock Concerts. The neatest thing about Ivan is that he is such a consummate, professional artist and he would draw and paint murals on our solid wood fence of the top pro skaters at the time. The murals were unreal! Eddie Elguera “El Gato” was one of the first skaters portrayed on our “wall of fame”. Can you believe we don’t have pictures. 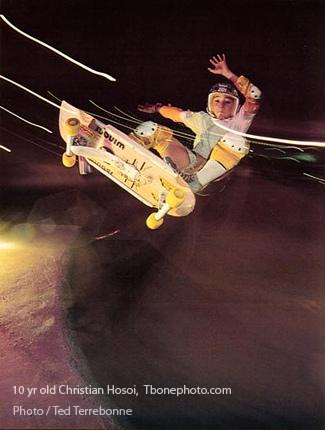 The 1980-1981, contest scene was still, hot and heavy with local boy Christian Hosoi emerging as the most bionic pro in the world along with other wonderful visiting pros like young Tony Hawk, working his way to the top. There was the Vans Series… (What nice people, Everet Rosecrans and skateboarding sons). The Powell Peralta Gold Cup Series with Stacy Peralta as the affable, magnanimous director with top notch officials. (See video). Our own Pro Am Banked Slalom, pitting skateboarders vs. roller skaters with a $5500.00 booty. The A.S.P.O. (Association of Skate Park Owners) contest events were special with our own Marina skate team visiting other parks via the “Dogtown Express” team van. The “Explorer Olympics” were grand, (See video) and many other skating events. Unfortunately, by this time, due to lack of recreational skaters and revenue, Marina Del Rey Skatepark had to be put up for sale. We tried to sale it to any Skate park operator but after about six months, it was sold for a small amount to recoup part of initial investment. On the positive side we never had a major lawsuit or any disabling accidents. Marina Del Rey Skatepark became a successful health club for about 20 years. With this website we want to be able to share memories, stories, interviews, photos, videos etc. Marina Del Rey Skatepark had such a nice staff, clientele and associates. We hope that you will be able to see yourself in some of our images and reminisce with a smile. We will be adding to and improving this website with your help. After a while we will figure out how to show and share videos from the different contests and events. Thanks for the nice memories and great times.